I’m not a car buff, by any stretch, but I couldn’t get enough of the classic cars in Cuba. From an age where form could trump function, the lines of these lumbering machines never failed to capture my attention. Cubans like to brag that they have the best mechanics in the world. With the embargo in place that has kept them from updating their vehicles, they’ve had to make their cars last and last for a long time. When you know that you may never own another car, you do everything you can to make sure the one you had stays in good working order. And if it’s the source of your livelihood you start caring for it like a baby. A majority of these classic cars are cabs for hire and for a cheap fare, you can catch a ride in a little piece of history. This entry was posted on Tuesday, March 12th, 2013 at 5:40 pm. 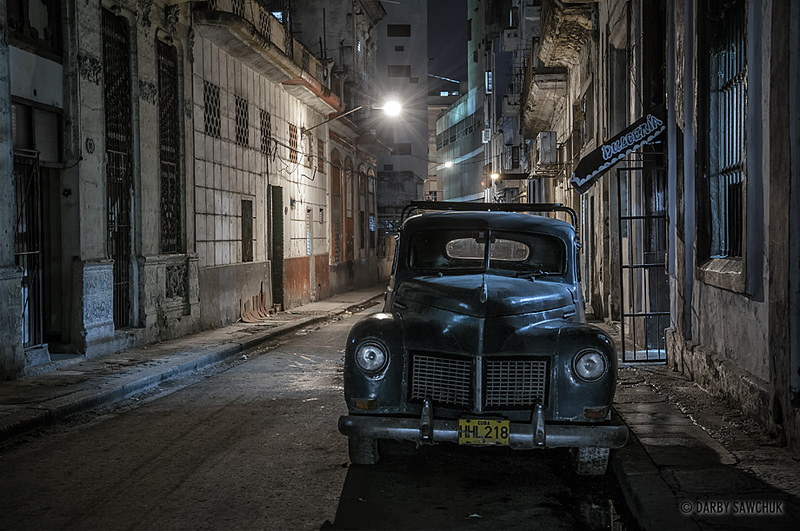 It is filed under Blog, Cuba, Photo of the Day, Photography and tagged with classic car, cuba, havana, night photography, Photo of the Day, Photography, potd, street photography, travel photography. You can follow any responses to this entry through the RSS 2.0 feed.